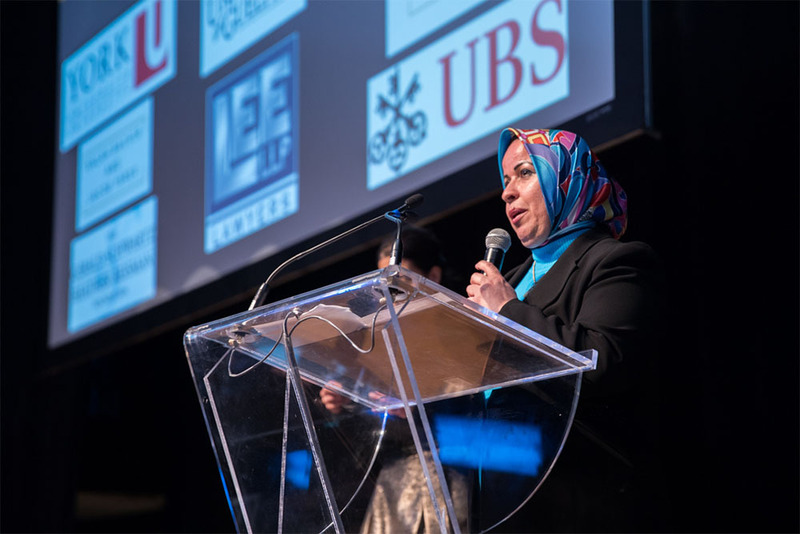 Maha Mehanna, a graduate student at Eastern Mennonite University’s Center for Justice and Peacebuilding (CJP), spoke as the invited scholar at the Daughters for Life Foundation’s sixth annual gala dinner in Toronto, Canada. Mehanna, a Palestinian Muslim peace activist from Gaza, is the first recipient of a CJP scholarship that partners with the foundation. Mehanna’s involvement in peacebuilding efforts in her native Gaza and in Israel has led to invitations to speak, lead and participate in workshops and seminars in the U.S., the Middle East and Europe. She first came to EMU in 2016 to attend CJP’s Summer Peacebuilding Institute as a Winston Fellow. She holds a bachelor’s degree in community development from the University of Calgary and a diploma in rehabilitation services from Mount Royal College. Mehanna’s 10-minute speech at the gala (shared in its entirety below) was greeted with a standing ovation from more than 400 guests. 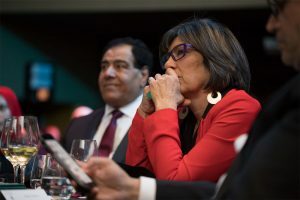 Journalist Christiane Amanpour listens to speakers during the gala before receiving the Lifetime Achievement Luminary Award. Scroll down to read her speech. Following Mehanna’s address and a panel discussion of other scholars, several awards were presented. Vera Baboun, the first female mayor of Bethlehem, was presented the Trailblazer Luminary Award. The Leadership Luminary Award went to neurosurgeon and philanthropist Dr. Michael Dan. Journalist Christiane Amanpour, who had visited Abuelaish’s destroyed apartment in Gaza while covering the family’s tragedy, was given the Lifetime Achievement Luminary Award. The Daughters for Life Foundation (DFL) was founded in 2010 by Dr. Izzeldin Abuelaish in the memory of his three daughters, killed when an Israeli tank shelled their home in Gaza. Bessan, Mayar and Aya are honored each year with the awarding of educational scholarships to women from the Middle East. Approximately 55 scholars, 341 awardees and five fellows from diverse countries and representing diverse ethnicities, have benefited. Dr. Izzeldin Abuelaish, founder of The Daughters for Life Foundation, at the gala. CJP’s partnership with the foundation is rooted in a two-day visit to EMU in 2014 when Abuelaish, an obstetrician and gynecologist by training, spoke about peacebuilding through a medical lens, sharing experiences from an impoverished childhood in the Gaza Strip to medical school in Egypt and becoming the first Palestinian doctor on the staff of an Israeli hospital. His commitment to peacebuilding in the region and beyond was deepened when three of his daughters and a niece died during an attack by Israeli tanks in 2009. A scholarship fund for a female Middle East student to embark on graduate studies in conflict transformation at EMU was eventually established, gaining a firm foundation through the generous donations of longtime CJP donors James and Marian Payne. 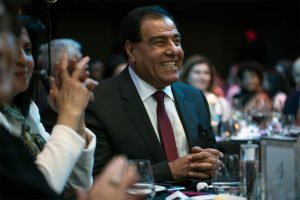 In fall 2017, CJP partnered with Abuelaish’s foundation to host an awards benefit fundraiser in Washington D.C.
Out of this event grew further plans for a February 2018 weekend of theatrical performances by the Washington D.C.-based Mosaic Theater, underwritten by the Paynes. Two of the four performances were of the play adaptation of Abuelaish’s best-selling memoir “I Shall Not Hate.” The event raised more than $40,300, including donations from the weekend’s performances, towards the estimated cost of $43,200 to cover two years of study (this total includes tuition, travel, living expense and health insurance). Allow me first to thank Daughters For Life Foundation represented by its Founder Dr. Izzeldin Abuelaish for inviting me to address this important gala today. I am deeply honored to be here with you. My name is Maha Mehanna. I am a freethinking woman, single by choice, born and raised in Gaza. If you are sitting here today, you already know that Gaza is many times referred to as the world’s largest open-air-prison, and for good reasons. Reviewing those reasons would not be a good use of our time. If you are sitting here in this hall, you already know about them in greater or lesser detail. Israel’s own historians have documented them very thoroughly. I received my bachelor’s degree in community development from the University of Calgary, and I have also obtained a diploma in rehabilitation services from Mount Royal College. Being a woman in Gaza has never been easy. Throughout my life, I encountered countless obstacles, hardships and challenges, and tried against all odds to fight for my life, freedom and education and build my future. In my community, women are generally persuaded to marry at an early age through family-arranged marriages. My four sisters accepted our family’s arranged marriage decisions and they married before reaching the age of 18. All of them now mothers of many children. I always wanted to be educated and decided to pursue my education and not to respond to family pressure and accept a traditional arranged marriage. When I was in my last year of high school, I rejected several arranged marriages my family had decided on for me. I had a very difficult time over my decision, but I never gave up, and kept fighting for my dream. My dream at the time was to get a university degree, get a job and be independent. I was driven toward independence. After graduating from high school, I received two full Canadian scholarships; the first one to study for a two-year undergraduate diploma at Mount Royal College, and the other one two years later to study for a BA degree at the University of Calgary. I was top of my class at my university, and I graduated with distinction. Shortly after my graduation, I worked for local and international organizations in Gaza. While I was working in Gaza, I took full responsibility for my parents and siblings still at home; I paid their living expenses and bills. None of that was appreciated; it was simply expected, because I was still single, by choice. I always wanted to go on and earn a master’s degree abroad, but I had to put that dream on hold for several years because I did not have enough resources to study abroad. Unfortunately, I was stuck in Gaza, but I never relinquished my dream of getting a master’s degree abroad. I kept holding on to the hope that I would make this dream come true one day, and I never gave up. One of the major events that impacted my path was the strict siege that has been imposed on Gaza for more than 11 years. It has cut off the Palestinians in Gaza from the rest of the world and made life nearly unbearable. This siege made me feel like an imprisoned bird in a huge cage. I felt that my life had stopped, and I began to lose hope of getting out of Gaza to pursue my dream. Despite the extremely difficult situation in Gaza, I chose to stick to hope, and never give up, no matter what. I am currently on my third try to complete a master’s degree. I had to abort my first attempt at the American university in Cairo, Egypt when I could not get out of Gaza to complete the residency portion. Everything I had invested in that attempt went down the drain. After that, I was granted a full tuition scholarship to the SOAS university of London but could not raise enough money I would need for living expenses in London. I had to decline the scholarship, but I did not give up. Now (my third attempt) I am halfway to a master’s in conflict transformation at the Center for Justice and Peacebuilding (CJP) of Eastern Mennonite University (EMU), Virginia after being awarded the Daughters For Life scholarship. It took me several months to obtain all necessary travel permits from the Israeli border authorities to be able to cross the borders and travel to the US through Amman/Jordan to pursue my master’s degree. As a recipient for the Daughters For Life scholarship this year, I would like to express my sincere appreciation and gratitude for Daughters For Life and their support and generous contribution. I am deeply honored to be one of this year’s scholarship recipients, and I am grateful for the opportunities this award provided me. Receiving this scholarship helps me reduce my financial burdens and provides assistance for me as I continue pursuing my master’s degree. Joining the CJP master’s program has been my dream since I was awarded the Winston Fellowship to the CJP Summer Peacebuilding Institute at Eastern Mennonite University in summer 2016. I found that the CJP master’s program corresponds well with my future plans to do practical work for organizations dedicated to helping women and girls in my country “Palestine”. It was my ambition to be admitted and further my educational and training goals in the field of conflict transformation and peacebuilding and gain extensive knowledge for my professional work. I would like to use this opportunity to thank CJP/EMU for welcoming me to their community, treating me with dignity and respect, and making me feel at home. Once again, I can’t thank Daughters for Life enough for generously supporting me with a full scholarship. I would also like to thank each and every one of you for supporting the Daughters for Life Foundation in helping young women achieve their dreams. Your support made it possible for me, and other Daughters for Life scholars, to pursue our dreams of studying at great universities and equip us with necessary tools and skills to go back home and make a difference. This scholarship made a huge difference in my life and enabled me to spread my wings and pursue my passion fearlessly. It is a privilege to be awarded this scholarship, and it motivates me to focus on my studies with renewed confidence while still enjoying my university life. Regards to Maha, I remember her during the 2016 SPI. All dreams are valid and nothing will stop that.